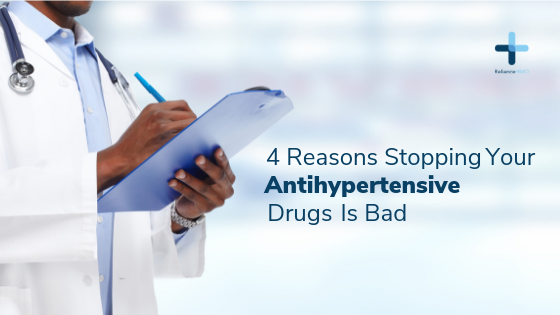 Often times, people with hypertension who have been placed on medications skip taking their drugs or stop taking them entirely. Why? It’s either the drugs are too many and they sometimes forget to take them or are tired of swallowing these pills. Some stop taking their medications entirely when their blood pressure reading is normal after checking on more than two occasions. One of the complications that can occur if you stop taking your medications (uncontrolled hypertension) is either haemorrhagic or ischaemic stroke. This is when some blood vessels (arteries) in the brain ruptures and blood leaks into the brain substance (haemorrhagic stroke), or when blood clots form in and blocks arteries in the brain, preventing oxygen and nutrients from reaching the affected part of the brain. This will result in either instant death or a permanent paralysis of the part of the body controlled by the affected brain region if medical intervention doesn’t come within 30 minutes to one hour. Poorly treated hypertension (from stopping medications) can predispose to damage to the blood vessels of the retina at the back of the eyes which leads to blurring of vision, affecting one’s eyesight, and on the long term can cause blindness. Uncontrolled hypertension can result in damage to the blood vessels supplying the tissues of the kidneys, which manifest as reduced urine output and swelling of the legs. If drug treatment is not resumed, kidney functions will worsen to the point of the affected person needed regular dialysis and finally a kidney transplant to survive. It is important to note that drug treatment of hypertension is for life. Even if the blood pressure has normalised, one must not skip or stop one’s medications, except there’s a case of adverse effects from the drugs which one’s doctor must be alerted for a possible replacement with another drug.